People have always used fashion to judge people but the flamboyant looks of 17th Century London inspired some intense abuse – or maybe the wearers’ actions were more responsible for such a reputation. The term cavalier was actually an insult created by the roundheads who disapproved of the elaborate excesses of the fashionable elite. It first appears as a term of reproach and contempt, applied to the followers of King Charles I in June 1642. 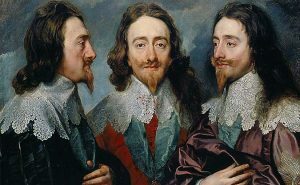 We now apply the Roundhead view of Cavaliers to many men of fashion in the decades before the Civil War in 1640. 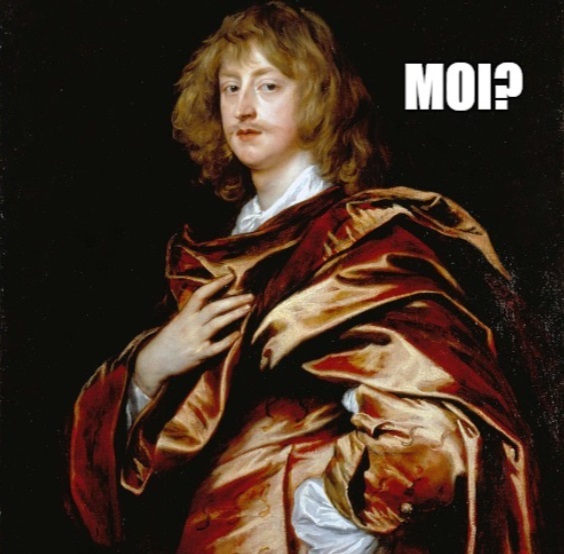 But what inspired this radical change in fashion from stiff Elizabethan styles to flowing locks and velvet? King James’ building projects had come to fruition under his son Charles’ reign. Rapid migration to London for trade and training was combined with a new social season that brought aristocrats to high-end entertainments. These brought people looking for work to support this thriving market. This period also saw the rise of colonialism under the East India Company and London was a trading hub in direct competition with Amsterdam for these new imports. Lord John Stewart, c. 1638 (left), his brother Lord Bernard Stewart (1623–1645), by Sir Anthony van Dyck. National Gallery. Of course the above accusations of the cavaliers are based on actions and manner more than dress and yet we draw a strong correlation between the look and identity and their reputation. Look at how we interpret a ‘Cavalier attitude’ today and dress remains a factor. The costume of the scoundrel is always louche and luxurious. The manner of clothing was much less restrained than past fashions and copied women’s styles of high waists, wide lace collars, and lace cuffs. Knee-high boots were often turned down with lace while wide-brimmed hats with feathers crowned long hair, pointed beards and moustaches, and shoulder capes. Pantaloon breeches were overtaken by Rhinegrave breeches which were ornately decorated and skirt-like. Purely aesthetic lace ruffles called cannons were worn just below them. Large collars were soon replaced with ruffled lace jabots as neckwear. Square-toed, high-heeled shoes with rosettes replaced boots. Men curled their hair and grew it past the shoulders or simply wore wigs of the same style. Long hair was a Cavalier essential met with intense criticism. Meanwhile the lovelock of hair was popularised as a plat that hung over the left side to cover the heart, which is believed to have been to emulate medieval courtly love tokens and can be seen in this famous depiction of Charles I.
William Prynne, a puritan pamphleteer, wrote Health’s Sickness. The Unloveliness of Lovelocks in 1628 and said that for men to wear their hair long was “unseemly and unlawful unto Christians”, while it was “mannish, unnatural, impudent, and unchristian” for women to cut it short. He related the story of a nobleman who was dangerously ill, and who, on his recovery, “declared publicly his detestation of his effeminate, fantastic lovelock, which he then sensibly perceived to be but a cord of vanity, by which he had given the Devil holdfast to lead him at his pleasure, and who would never resign his prey as long as he nourished this unlovely bush”, and so he ordered the barber to cut it off.